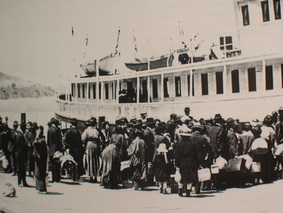 During the early 1900s, the port of entry for many immigrants from Japan was San Francisco. As shown here, newly arrived immigrants are disembarking and setting foot on America's shores for the first time. Angel Island was a facility used to house many different ethnic immigrants including "picture brides" from Japan. Many of the early Japanese immigrants were single, male laborers. About 8,600 women in Japan, matched up with male bachelors by their respective families in Japan, initially stayed here at Angel Island for medical and legal certification. Angel Island is located north of San Francisco and just off the southern tip of Tiburon. Within days following President Franklin D. Roosevelt's issuance of Executive Order 9066, the U.S. Justice Department began knocking on doors and rounding up persons of Japanese ancestry on grounds that, as community leaders, they constituted a potential threat of espionage and sabotage. 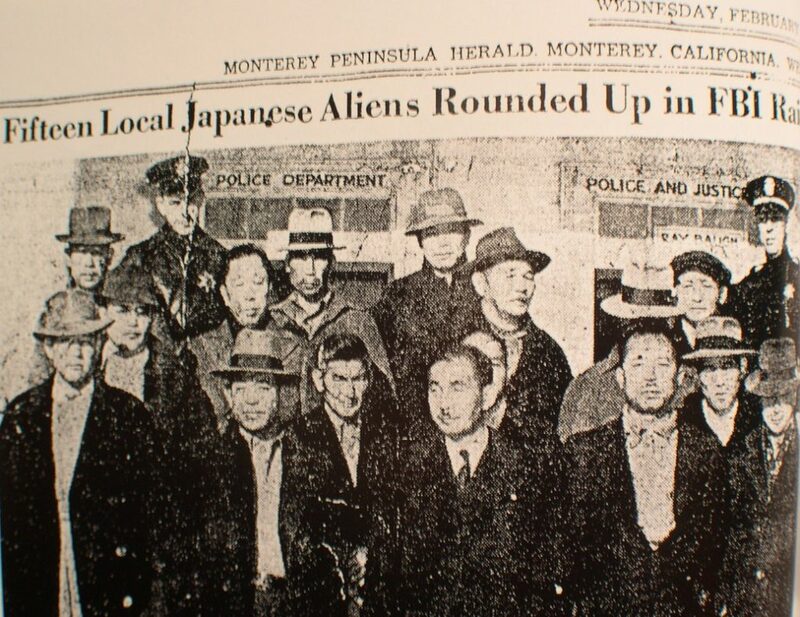 This photo from the February 11, 1942 edition of the Monterey Peninsula Herald, shows fifteen Japanese legal residents arrested by the FBI and detained at federal facilities. The JACL Heritage Center was established in 2008. Our mission is to collect, maintain and preserve the Japanese cultural legacy of the Monterey Peninsula. To fulfill our mission, the Heritage Center Committee acts as a decision-making arm. Our programs and activities focus on the first immigrants from Japan who arrived on the Monterey Peninsula in the 1890s and all ensuing generations of Japanese Americans. Confronted by a new and different culture, early immigrant arrivals on the peninsula faced many social, political and legal challenges defined by conditions in the larger California and West Coast environment. For example, in 1906, Japanese children in San Francisco were required to attend a racially segregated school for Asians. 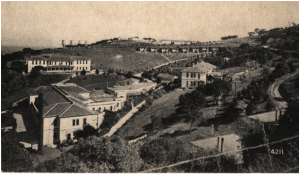 This school crisis was diplomatically resolved by the Root-Takahira Agreement of 1908, but at a cost of limiting Japanese labor immigration to the U.S. By the end of 1920 the California Legislature had enacted two alien land laws (1908 and 1920) that prohibited Japanese from owning land. In 1924, the U.S. Congress passed the Immigration Act of 1924, further restricting Japanese laborers from entering the U.S. The success of Issei and Nisei in farming, fishing and small business raised the competitive ire and anti-Japanese resentment of American labor unions, farm bureaus, and anti-Asian organizations between 1910 and the 1940s. When President Franklin D. Roosevelt declared war on Japan on December 8, 1941, the War Department, Justice Department, the U.S. Congress and the U.S. presidency issued policy decisions with life-changing impact on persons of Japanese ancestry living on the West Coast. Notably, Executive Order 9066 issued on February 19, 1942 authorized a Western Defense Command that mandated restricted military zones, curfew hours and civilian exclusion orders. Executive Order 9102, issued in March 18, 1942, established the War Relocation Authority, a federal agency that oversaw the ten concentration camps. Between February and September of 1942, 119,000 persons of Japanese ancestry living in four western states were forcibly moved to incarceration centers and eventually transported to the ten camps. Life in the camps and resettlement in society after 1945 raised a multitude of questions. How did families endure life in the camps and what adjustments were made to make life more tolerable? After the war, where would they go and what would they do? Would former neighbors and community accept or reject them? What happened to their prewar homes, property and other possessions? Since no act of sabotage or espionage by a person of Japanese ancestry was ever proved in a court of law, was EO 9066 justified? Were constitutional rights of Japanese Americans, such as due process and other civil liberties, violated? Would the Nisei and their children be allowed to get an education and enjoy equal social and economic opportunity? What was the emotional cost of life in an internment camp? And why were so many Issei so silent about their wartime experience in camp? Has life improved for the Sansei, Yonsei and Gosei? Given this overview of events and WWII-related issues, the JACL Heritage Center believes it is important to gather information that will help explain the real-life opportunities afforded and denied to persons of Japanese ancestry living on the Monterey Peninsula. In today’s world, what we learn from our programs and projects about Japanese culture and the Japanese American experience on this peninsula, has relevance for contemporary immigration. In the late 20th and early 21st centuries, millions of new immigrants and refugees have continued to arrive on America’s shores. They have left homes in Asia, the Middle East, Mexico and South America to seek a new life in the United States. Can the lessons bound up in Japanese culture and the Japanese American experience enable us to pursue wise decisions in dealing with our new ethnic and racial immigrant neighbors?